ROCHESTER, N.Y. – Semrock released four new optical filter sets for fluorescence imaging which enable the choice of substantially increased brightness or enhanced contrast when imaging the ubiquitous fluorescent labels fluorescein (FITC) and green fluorescent protein (GFP). These new BrightLine® filter sets allow the user to either minimize photobleaching while increasing image contrast, or receive a light boost for a noticeably brighter image, particularly in low-concentration applications such as single-molecule imaging. 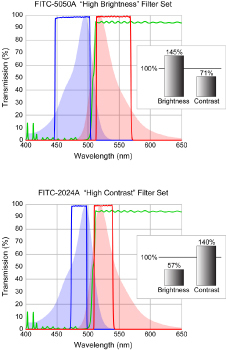 The single-band filter sets GFP-1828-A and FITC-2024-A offer the highest contrast of filter sets available today, while the GFP-4050-A and FITC-5050-A sets give the user the highest brightness among sets optimized for these fluorophores. Semrock will continue to offer the current and highly popular BrightLine GFP and FITC sets, offering the most optimal balance of brightness and contrast for most applications in a single three-filter set. The new filter sets simply extend the performance in both directions, offering users a complete range of performance for the same price. Semrock's hard-coated filter manufacturing process ensures permanent performance with "no burn-out" even under the most intense illumination conditions. Catalog products ordered by noon, EST will be shipped same-day. Rapid custom-sizing is shipped in under a week and a 30-day no-hassle return policy applies to all catalog products. All Semrock filters are covered under the company's five-year warranty. Semrock, Inc., a Unit of IDEX Corporation, manufactures optical filters that set the standard in performance and reliability for the biotech and analytical instrumentation industries, as well as innovative optical filters for more general laser and optical systems applications. All Semrock optical filters are made with hard ion-beam-sputtered optical coatings. OEM filters are manufactured in volume. End-users benefit from a wide selection of standard catalog products that ship from stock. Semrock's patented and patent-pending products include its highly acclaimed BrightLine® fluorescence filters, state-of-the-art filters for Raman spectroscopy, and other unique filters for lasers and optical systems. Semrock's innovative filters, made possible by combining modern ion-beam sputtering with Semrock's proprietary volume manufacturing technology, are covered under a five-year warranty.